With ectoin and natural alpine salt. Helps clear allergens from the nose. Soothes irritation. Instant cleaning effect. Helps to reduce mucus-trapped allergens. Soothing care. 100% naturally-sourced ingredients. Free of chemical additives & preservatives. Can be used without risk of rebound congestion.This medical device contains Ectoin®, a natural ingredient sourced from microorganisms that survive in extreme environments such as geysers and salt lakes. The Ectoin® solution supports the body's natural protection barrier against irritants. 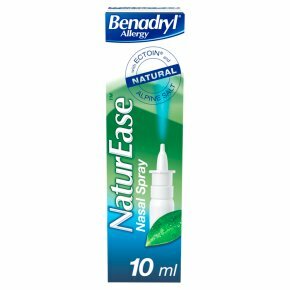 Benadryl® Allergy NaturEase? Nasal Spray helps manage nasal allergy symptoms. It works by cleansing and soothing the irritated nasal passage, using 100% natural ingredients. This product can be used in addition to your allergy medication. Dosage directions: Adults and children over 6 years: Apply 1-2 sprays in each nostrils several times a day as required, unless otherwise prescribed by your doctor. Do not use if security seal is missing or broken.<br><br>CAUTION:<br>Do not use for more than 6 weeks after opening.<br>KEEP OUT OF THE SIGHT AND REACH OF CHILDREN.<br>Do not store above 25°C.<br>Do not share this Medical Device with others.<br>Please read the instructions for use carefully.